Ice in a cup, soda cooled. Now, imagine this ice the size of three Greyhound buses, deposited in blue-gray Arctic waters amid granite mountains whose peaks are one billion years old, from whose sides cascade waterfalls formed by melting glaciers. You are sailing on a luxury cruise ship through a unique maritime channel found at the southern end of the world’s largest island Greenland. This channel called Prince Christian Sound or in Greenland’s Inuit (Eskimo) language “Ikerasassuaq” (do not even attempt to pronounce these helter-skelter vowels, unless you want an Inuit to smile at your inadequacies.) is a 66-mile long (105 kilometers) passage which cuts through the southern half of Greenland from the east to the west coasts, zigzagging like an anaconda through a river. As the Vikings did a thousand years ago, ships transit through Prince Christian Sound, open no more than three months a year, to avoid the treacherous waters and currents found at the tip of Greenland. 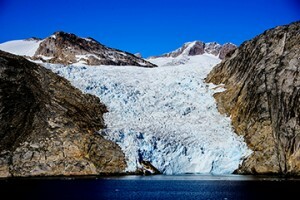 Voyaging through Prince Christian Sound is like sailing through the Rockies, graced with glaciers and, of course, ever-present icebergs. The cruise director is his ususal enthusiastic self (aren’t they all hired to be vibrant, energetic about every part of the cruise itinerary? ), so I am skeptical when he exclaims, over the PA system, the transit will be the voyage’s highlight. For once, he was right. Entering the channel from Greenland’s west coast, our 61,000 ton ship (equivalent to 3,400 blue whales) unexpectedly feels diminished. Cradling the ship are granite mountains, stolid witnesses to innumerable ice ages; down their sides glaciers have dutifully marched to the water, calved, and, receded, leaving tell-tale black scratches as if clawed by the world’s largest polar bear, extracting painful revenge against the mountains. A dash of cloud and a touch of fog poise themselves, like a bride’s veil, parting here and there to reveal the bold beauty of the granite mountain faces. While the ship is a respectable ten stories high, the mountains—in a competition the vessel can never hope to win—soar nearly to skyscraper levels of 4600 feet. As we sail the Sound, these ageless granite giants rest no more than two miles away on either side of the vessel, not quite touching distance but close enough to marvel at their size, their endurance, their testament to indelible timelessness. Then, something is in the water. To our starboard—the right side of the ship for landlubbers—is a kayaker, an Inuit, working the very craft invented by his people over four thousand years ago. His face in a corona of fur and his body enshrouded in waterproof animal skins, he has kayaked out to examine us. It is show time: he performs the Greenlander Roll, not a new Hip Hop move but a life-saving maneuver whereby kayakers right their vessels with their oars to save themselves from capsizing in glacial waters. Successful, he signals by waving his oar like a semaphore on a rail line; we gesture back, crossing and uncrossing our arms in an X over our heads, that universal signal of greeting. A connection is made. Here am I, an American Southerner accustomed to summer days with temperatures routinely hitting 90 degrees Fahrenheit and humidity to match, on a cruise ship plying glacial waters near the world’s top, waving to an Inuit who is more than comfortable in his Arctic environment. On this June day, the kayaker is there to witness us pass through what he certainly considers his fjords, for he has paddled out from the snowy north’s most isolated village. Aappilattoq (“The Red Place”) is no more than a bend in the channel with just two hundred souls, a village snowed in most of the year, reachable only by helicopter. This village, nestled on a small outcrop, is towered over by a nearly vertical mountain, with one of its greatest enemies (besides the weather) being unwelcomed polar bears sauntering in. From a distance, I can see the village’s garnet and royal blue one-story buildings, each with its own flagpole; it is often half jokingly said bright colors and tall flagpoles help villagers discover their homes during the deepest snowfalls. Dish networks also crown the buildings. While the cruise passengers have connected with the brave kayaker, his village, through the 21st century’s most ubiquitous bond, is linked to the rest of the world. Then, it happens. The black hull of our leviathan cruise ship is even darker as we sail by the white foes of the north: icebergs. Rising like twenty story buildings, stretching a city block, no two icebergs—like fingerprints—possess identical shapes. The mesa or table bergs (could a polar bear be on that one?) encourage thoughts of an airport runway. The next one on the horizon is a Dutch girl’s lacy cap with a high peak. The one around the bend is a croissant, that one over there a submarine, with coning tower exposed, riding the sea surface. Each possesses its own micro-climate as melting ice produces a personal cloud system. When the sun pokes out, a berg glows a different color: aqua or turquoise, or—what I have always known but never experienced—“icy blue,” surely the envy of any jeweler who classifies diamonds. Bergs are alive. Like gentlemen tipping their hats at the fair lady of a ship gracing their view, they nod their heads in greeting as our ship passes gingerly. Bergs dance. The submerged portion melting faster than what is exposed causes bergs to sway like Fred Astaires. Bergs talk. They crack as the wind carries their cold breaths across the waters. 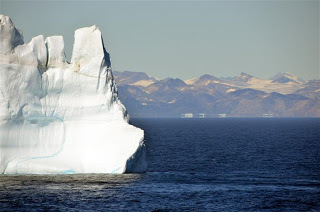 The ancient Greeks and Romans believed all winds carried the souls of the dead; here, iceberg winds carry a iciness born from glacial ages 12,000 years ago. 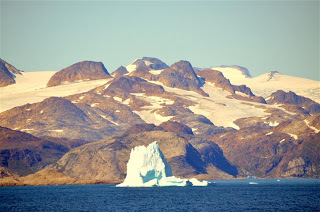 The bergs’ ragged, varying shapes differ from the ice core samples secured when scientists violate glaciers with plunging tubes. Instead of a smooth, straight, penetrating look at time, bergs are samples of how time handles us all: serrated to reveal poignant scars where they have separated from the mother glacier; rough and jagged with time-induced wrinkles. With only one-eighth (or less) of any iceberg visible above water—aren’t people the same way?—what lies beneath is not to be ignored. “Everything that is visible hides something that is invisible” (Rene Magrite). Green scarf and down parka. Not enough protection for this soul from the moist, muggy South, so scooting inside, I accidently enter the ship’s play area, finding a solitary eight-year old boy, eyes affixed to his video screen, howling “I did it!” Pumping his arms like a Rocky of the North, he glances around the room, desperately seeking an adult to praise him, to share his vainglorious victory. He has just won his electronic game, never having gazed out the cabin door at the real show. Granite giants, a fearless kayaker, the whispering, threatening bergs provide a timeless moment he has no time to cherish. As our vessel rounds the channel’s last bend, a touch of humanity appears. On a narrow ledge, perched high above the South’s mouth are one-story buildings cabled to the ground defiant of the body-smashing winds reaching 90-175 miles per hour. It is one of the world’s remotest weather stations, established during World War II by the U.S. Army to provide vital weather reports for the North Atlantic planes, convoys, and anti-submarine actions. With this station, and others like it, the Allies secured weather information before the Nazi forecasters, who, except in Norway, had no such westerly stations. This little remote station is even said to have delivered information helping General Dwight D. Eisenhower determine if there would be a break in the weather for the June 6, 1944, D-Day invasions. Today, this “Hell’s Corner,” as it is called, is staffed with scientists, who, like their World War II counterparts, receive supplies by plane drops, being isolated ten months a year, with only radio contact and endless games of Monopoly. Our intrepid captain has done it. The ship has journeyed through a place which opens up to very few, and only during the summer months. Here, nature gives more than simply “scenic cruising” as promised by the cruise’s brochure. The Sound is a scene of connections. It binds together passengers who have traversed safely this “river of melted snow” (as the explorer John Cabot reportedly named the Sound). Passengers also couple with nature, thanks to the bergs’ being a tabula rasa for a human’s imaginative engagement. The Sound, though, reminds the ship and its passengers this connection is tenuous—the little weather station on the edge of the north experiences but does not control nature. We are, after all, only little humans on a ship.